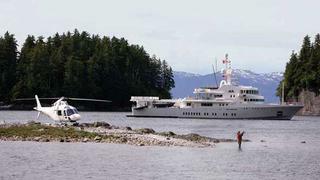 Caroline Walters at Burgess tells me of a new central agency for sale as the 59.2m expedition yacht Senses joins the fleet. Designed, built and engineered to surpass the challenges of exploring the world’s oceans, Senses carries a comprehensive inventory of equipment and will exceed the expectations of any 21st century adventurer. Senses is the opportunity for a truly unique lifestyle in luxury yachting with stylish, well appointed interiors designed by Philippe Starck. Split-level decks provide open and shaded sun-lounging areas, secluded side pods, sheltered outdoor dining and informal seating areas, an airy and light gymnasium and a private beach club complete with Jacuzzi and vast sun beds. With impressive volume provided by six decks and a beam of 12.7m, Senses can store three tenders laterally, has full helicopter capability and a stern-launched 42’ Nelson tender. Currently undergoing a full schedule of winter works in Portsmouth, UK, the superyacht will be in immaculate condition when she leaves the shipyard in May. Senses will be available for inspections while cruising the Baltic this summer and will then move to the South of France by September, where again, inspections are encouraged. Accommodating up to 12 guests in flexible accommodation of five or six cabins, Lloyds classed and MCA compliant, Senses is asking €35 million.